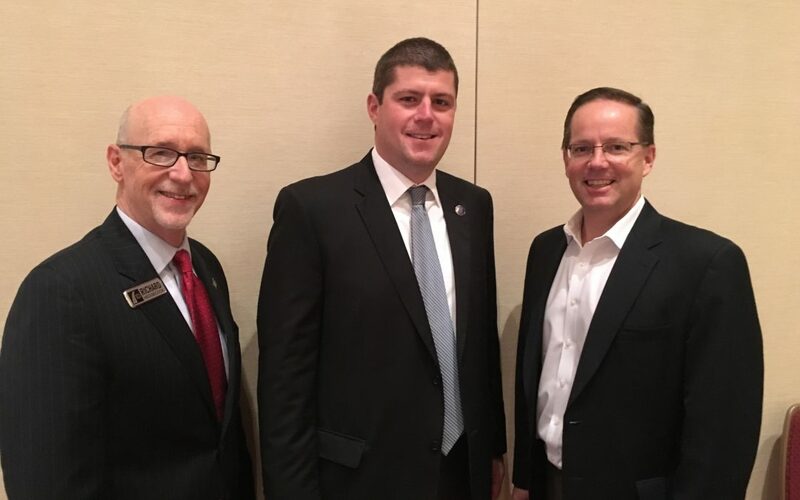 Richard Hedgecock, president of the Indiana Constructors, ARTBA’s chapter affiliate; Joe McGuiness, commissioner, Indiana Department of Transportation; and Matt Cummings of AECOM, ARTBA chairman. Safer highway work zones could be a big benefit of more automated and connected vehicles on U.S. roadways in the coming decades. That was the hope of transportation design and construction industry professionals after hearing the “Autonomous Vehicles & Impact on Infrastructure Development” presentation at ARTBA’s Central Regional Meeting, Nov. 14-15, in Indianapolis. Dr. Chandra Bhat, director of the Center for Transportation Research at The University of Texas, and Dr. Christopher Poe, assistant director, Texas A&M Transportation Institute for Connected and Automated Transportation Strategy, gave the featured talk. Even before fully automated vehicles dominate the roadways, technological advances are already improving safety, Bhat said. For example, all new vehicles will be required to have back-up cameras starting in 2018, helping to reduce the 200 annual back over fatalities and thousands of injuries. Nearly all automakers have agreed to make automatic breaking systems standard by 2022. Industry leaders and public agency officials also told nearly 60 meeting attendees that the Central region market looks like a mixed bag in 2018 and beyond. Given a major funding package passed earlier this year, Indiana expects significant increases in highway design and construction activities. The Illinois Tollway is also planning a complete rebuild of its system in the northern part of the state during the coming years. However, solutions to transportation funding shortfalls in Missouri and Wisconsin remain elusive. The meeting was partnered with Indiana Constructors Inc., ARTBA’s chapter affiliate.